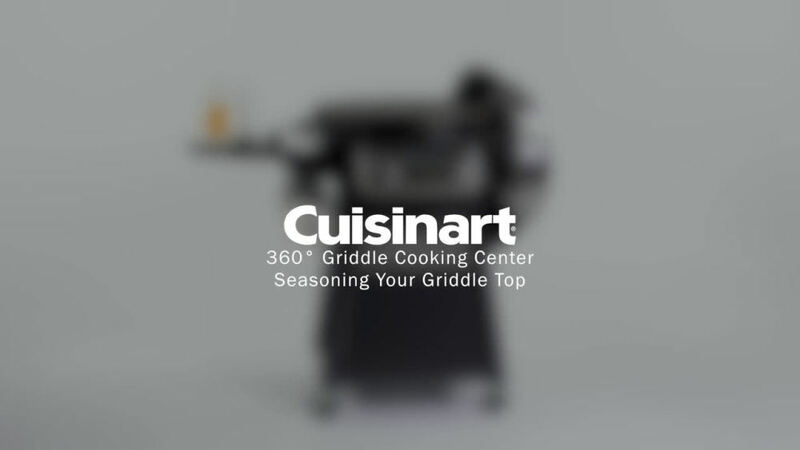 Experience 360&deg; of Griddle Cooking Versatility! 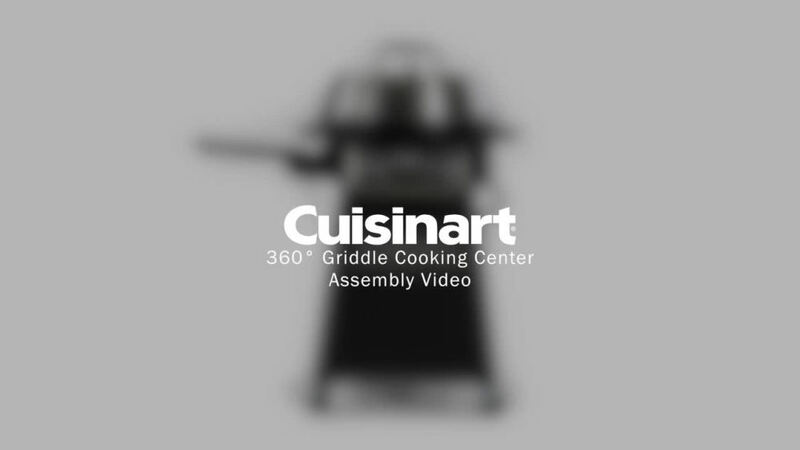 Whether you are cooking for a small crowd or a large party, the Cuisinart 360&deg; Griddle Cooking Center will amaze any audience. Breakfast, lunch and dinner, the 22-inch diameter cooking center can handle it all! It features a 360&deg; grease pan and rear grease cup, making for easy access and clean-up. The cooking center comes with a quick access paper towel holder. It also includes a stainless steel lid with an integrated vent, enhancing the features of a normal griddle! This lid creates versatility to steam, roast, smoke or warm! From eggs and pancakes to burgers or stir-fry, the Cuisinart 360&deg; Griddle Cooking Center gives you the ability to explore your culinary creativity. 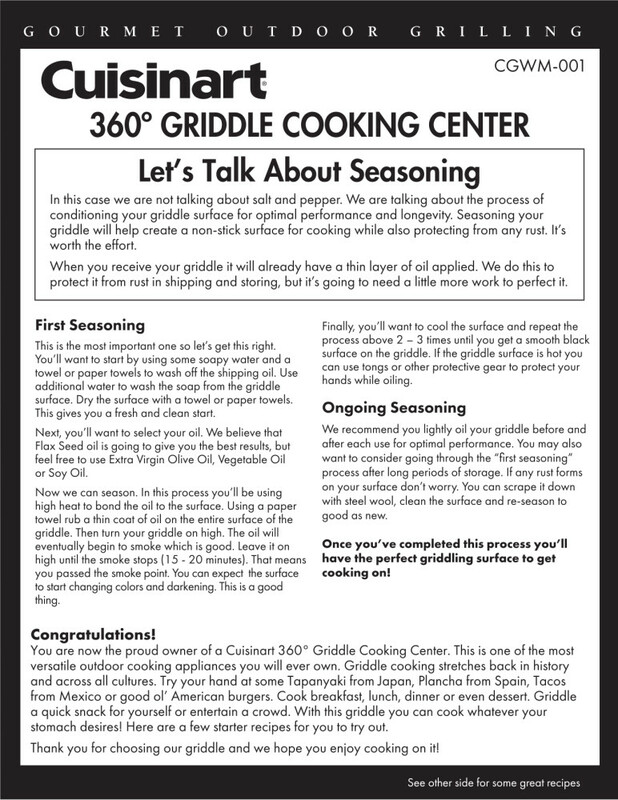 Experience 360° of Griddle Cooking Versatility! Whether you are cooking for a small crowd or a large party, the Cuisinart 360° Griddle Cooking Center will amaze any audience. Breakfast, lunch and dinner, the 22-inch diameter cooking center can handle it all! It features a 360° grease pan and rear grease cup, making for easy access and clean-up. The cooking center comes with a quick access paper towel holder. It also includes a stainless steel lid with an integrated vent, enhancing the features of a normal griddle! This lid creates versatility to steam, roast, smoke or warm! 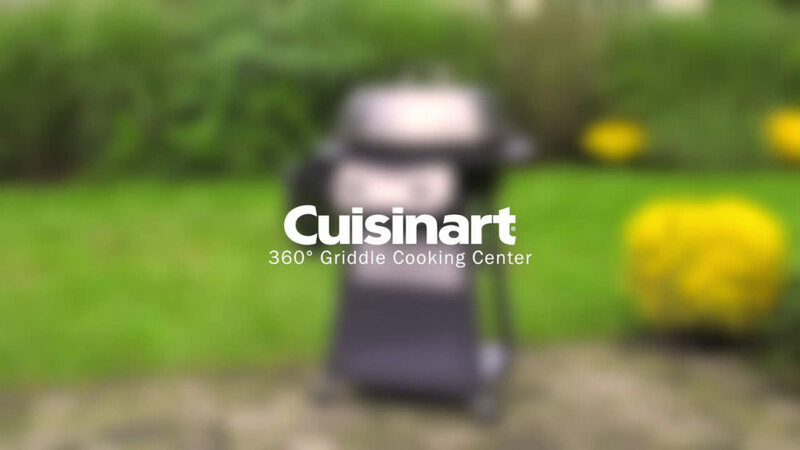 From eggs and pancakes to burgers or stir-fry, the Cuisinart 360° Griddle Cooking Center gives you the ability to explore your culinary creativity. Absolutely amazing for cookouts! I love that there is a place to hold cooking utensils and, get this, there's also a PAPER TOWEL HOLDER!!! Now you don't have to worry about napkins blowing away or running back inside to get a napkin to clean up a mess. This griddle has everything you need - a place to store cooking tools, a shelf to hold marinated meat/veggies, paper towel holder, and of course, the griddle. It cooks well and is easy to clean. The size is great and doesn't take up too much space on my small patio. The wheels make it easy to move and store when not in use. Overall, I highly recommend this product and can't wait to host more cookouts! I am writing this review as part of a contest but all opinions are my own. Totally beats a regular BBQ! This grill brings together cast iron cooking, bbqing and broiling. I love how it is so versatile and you are able to make anything from steak to fajitas to pizzas. It cooks very evenly and is easy to control the temperature. What I love most is how easy it is to clean! You dont see it when looking at it, but it has a slight angle so that grease can drip off into an easy to empty tray. There is ad rip pan all the way around the grill that is easy to clean by simply wiping it with soap and water. This beats a traditional BBQ because it doesn't allow for corrosion of the burners since the grease isn't dropping on to them. This would be a grill masters dream and the price point couldn't be better! I am writing this review as part of a contest. I saw this used in a demo and saw it in action - it's a very impressive and sleek cooking surface that is more like a giant cast iron. You can cook anything on it, from meat to pancakes. The table on the side has hooks on it for cooking utensils which is a nice feature. I was also able to see it cleaned and it looked very easy, but do keep it mind that it will need to keep seasoned. The price point is actually way lower than I expected for the Cuisinart brand. The food from this grill was so tender, so juicy, so delicious. I am very excited about this grill. The cooking surface is pretty large, and the design of the plate where the oil and juice drips into the pan from the side is brilliant. This review is part of a contest. Can you cook on just the rack without the griddle? 1. No, you cannot cook on the rack without the griddle. 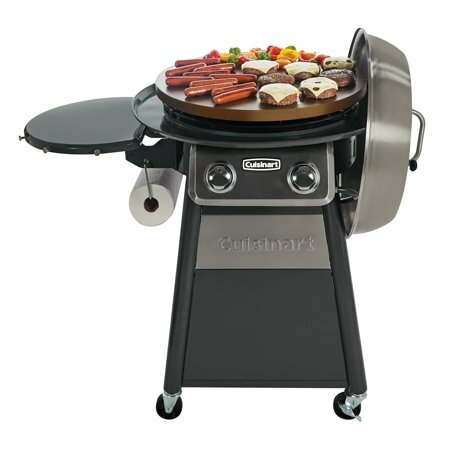 Does the grill top rotate? 1. 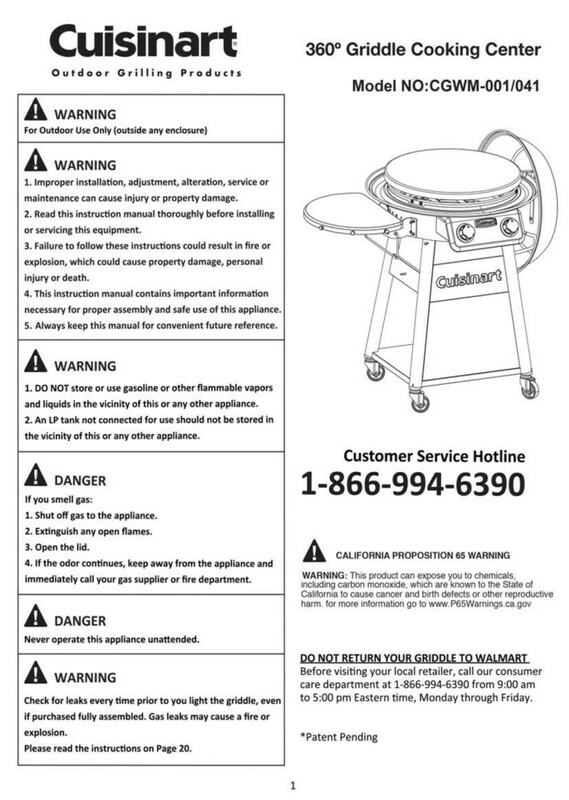 No, the grill top does not rotate. where does the propane tank sit? 1. The tank will sit under the grill.